As I was looking back through all the cookie recipes on the blog for the Cookie Exchange Post, these butterfinger cookies caught my eye. Even though I’ve only been blogging for about 3 years, it seems that recipes get kind of hidden in the archives. And so just like with the Oreo Cupcakes, I wanted to dig this one out! 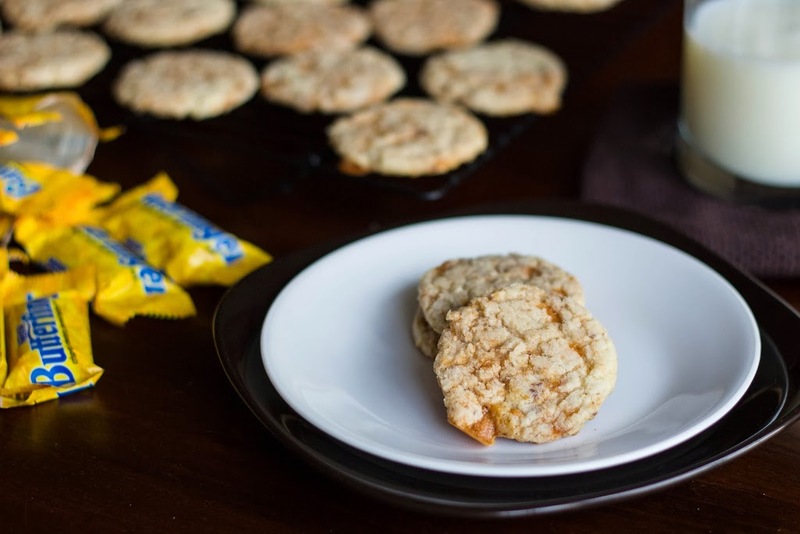 Butterfingers aren’t necessarily one of my favorite candy bars, but when crushed and added to a basic sugar cookie dough they transform into something amazing! 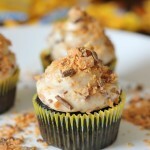 =) Slightly crispy on the edges and chewy on the inside with lots of butterfinger flavor. They’re quick and easy too. You don’t even have to chill the dough – which is a definitely plus this time of year! Maybe you didn’t give these cookies a try the first time around, but I’m giving you a second chance ;). Enjoy! 2. Beat butter and sugar together until light and fluffy. Add egg and vanilla and mix well. 3. Gradually add flour and mix just until combined. Fold in candy pieces. Scoop dough onto lightly greased cookie sheets using a #60 scoop. 4. Bake for 9 minutes. Cool on wire racks. Makes 48 cookies.